Incident Analyst is an e nterprise-level unusual event management system designed to administer all aspects of the data collection process. AEMS fully supports multiple site locations both in terms of branch-based data collection elements as well as reporting on a hierarchical and functional basis. 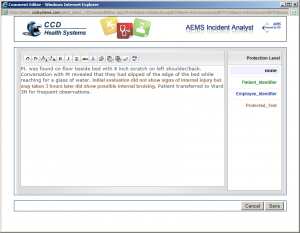 AEMS includes an extensive set of features and functions that make incident reporting and management intuitive for users. Our system will support both ‘anonymous’ report creation and ‘identity reporting’. 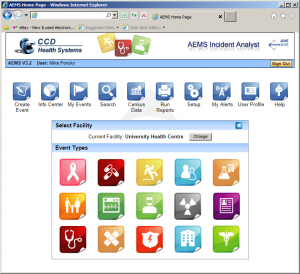 Browser-based Incident Reporting: AEMS runs as a web application so all staff may have access using their Internet Explorer browser. The AEMS application is usually installed onto a regional or branch in-house web site thereby protecting it from public access. The application can also be installed using SSL certification in order to apply an additional level of encryption to the data moving between the server and workstations. Phase Driven Process Flow: The underlying feature that allows AEMS to parallel an organization’s existing processes is its capability of separating the incident reporting workflow into distinct phases; similar to the handling of a multi-part form. As the event enters each pre-defined phase, different management levels become involved and questions relevant to the current phase are presented for answers. The phases that an event enters can be tailored by a number of factors including branch, type of incident and severity. AEMS supports unlimited levels of management review and follow-up phases. Incident Questions: Each type of incident that might occur within your company requires that specific questions be answered in order to properly follow up on the direct cause or perform long-term trending of patterns. AEMS allows clients to display questions along with choices for alternatives. These questions are grouped into sets and placed on web pages using a host of formatting options. Initial form loading will be performed in order to deliver a turnkey solution. Context sensitive help: At all times while entering or reviewing incidents, users have access to help pages that guide them through the data entry process. Unlimited incident notes: Throughout all phases of the information gathering process, participants can enter any number of comments. All comments are stored with the User’s name and date/time stamp. During the review process, comments are displayed in chronological order and can only be modified by the original submitting user. Role based security: AEMS was developed from the ground up to support legislated security requirements. Role based permissions allow users to perform selected tasks. Rights to view and edit events are assigned to users according to their branch, department and confidential status of the event. Every action can be recorded and audit reports help Safety Managers monitor Employee privacy. Automated Reminders: When an event occurs, email notifications are sent to key management located throughout the organization. Notifications follow the department hierarchy, thereby only involving those that need be. In order to determine whether a department’s function (i.e. supervisor) needs to be notified, the system takes into account the location where the incident occurred along with its severity and confidential status. Selected functions can automatically be notified as the event enters each phase. Email Templates: Notifications are sent to key management staff in order to solicit their participation in an event. A participant reviewing the incident can send out these notifications automatically or manually. Various message types are available when notifying a participant. They include: Information Only, Comment Only, Collaboration, Second Opinion and Responsibility Transfer. All email messages can be set to include or exclude event details. No confidential information relating to employees is included in the email message and the link displayed within the email is encrypted. Pre-defined Collection Tables: To expedite initial configuration, AEMS ships with several Collection Lists (Pre-defined tables) that can be enabled to prompt for specific information. The following items can be easily loaded and assigned to display when specific event types are entered. The added benefit of using CCD created collection lists allows for standardized data entry and reporting. Security & Privacy Protection: AEMS was developed from the ground up to support legislated security requirements. Role-based permissions allow users to perform selected tasks. Rights to view and edit events are assigned to users according to their branch, department, and confidential status of the event. Every action can be recorded and audit reports help Safety Managers monitor employee privacy. Detailed Audit Trail: Various levels of auditing have been incorporated into AEMS to provide Safety Management staff with the necessary tools to protect incident information collected. When enabled, all user activity is logged, including when they logged on and what menu selections were performed. Details about who saw or edited each event are also stored and can be reported on using one of several audit reports. AEMS also tracks which Users saw personal information about employees participating in the event and thereby collect the specific demographic information viewed. AEMS also tracks changes made to previously entered incident data by saving a snapshot of the old data into an audit log where privileged users can later view it. Connection to 3rd-party Database: In larger organizations, it is sometimes easier to locate employees through existing sources. Interfaces can be purchased to connect with (1) central employee repositories, (2) human resource information systems. In addition AEMS supports users logging in with their authenticated Windows username & password. Confidential Event Handling: Individual incidents or all incidents within a specified category (such as psychiatric events) can be flagged as confidential. Confidential events may advance through the workflow process according to separate criteria. For example you may want to skip phases in order to limit management involvement. Reporting: AEMS ships with over 25 standard reports, this will allow users to set custom criteria prior to running. Criteria selection permits limiting the report to certain departments, event types or changing the type of data requested. By changing select criteria, thousands of report combinations are available. Real-time Status: Also available to privileged users is access to an ‘Info Center’ Web page that provides an overview of event counts within their hierarchical department jurisdiction. 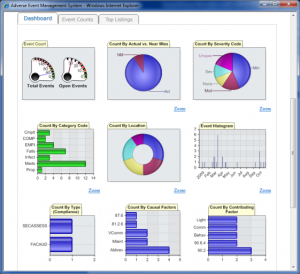 Dashboard-like graphics provide a visual overview of key indicators. Users can ‘drill down’ to display the event listing and then the individual incident details. AEMS includes a powerful Charting display that allows users to visually group events using pie charts, bar graphs or as trends. Users can further drill down to obtain greater granularity by clicking on the portion of the chart that they are interested in getting more detail. For information on customization using the AEMS Configuration Manager, please contact your CCD representative.